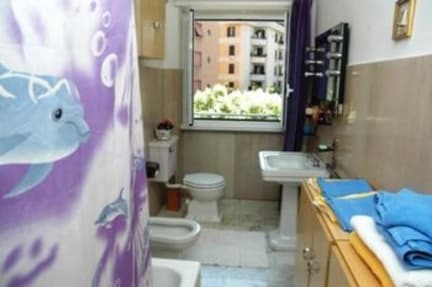 Cheerful one bedroom apartment of 75 sq.mt. 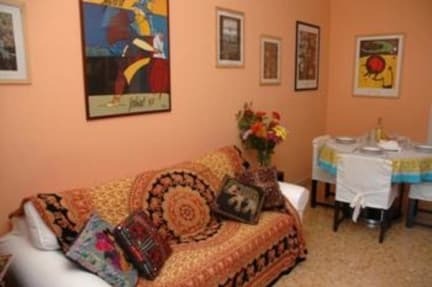 with two balconies, bright and spacious and conveniently located on the second floor of a building (with elevator) in the Aurelio neighbourhood, surrounded by restaurants, pubs, street shops, supermarkets, and close to the Vatican and St. Peter, (the subway is at 100 meters and buses in front of the building). The apartment, characterized by marble flooring and coloured walls, can comfortably sleep up to 4 people. The heating is centralized. The bedroom and the living room are equipped with air conditioning, in the living room there is the TV SAT, PC whit internet ADSL and free WIFI. Check in 2.00pm-10:00pm (we are very flexible as long as you tell as your arrival time. Cancellation policy 15 days (if you cancel too late or if you don't show up we will charge your credit card of the first night prize). To confirm the reservation we need a 40% paymenty (compulsory) by PayPal or credit card (Visa-Mastercard-Maestro-Visa electron-VPay-JCB) non-refundable.